The New York Film Academy’s photography school provides an experience like no other. Intensive, demanding, and hands-on, the Academy’s photography classes offer students the opportunity to not only acquire the fundamentals required to excel at photography, but also gives them the practical experience that will prepare them to excel as a professional photographer. The New York Film Academy offers a wide range of photography classes that are designed to help aspiring photographers. Each class is a fantastic way for individuals to learn both the technical and aesthetic concerns of photography and the real-world challenges they will face as professional photographers. Many students choose to enroll in the Academy’s more extensive photography classes, such as our One-Year and Two-Year Conservatory Programs or our Bachelor* and Master of Fine Arts* degree programs. Whether enrolling in a short-term workshop or a longer program, students in The New York Film Academy’s photography classes receive both fundamental training in the technical aspects of photography while learning to develop their aesthetic voice. Across our programs and workshops, students can expect to take the following core photography classes. To view the rest of the photography classes offered at the Academy, please click here. Photo: The core photography class of the photography’s school curriculum, Photo includes lectures, demonstrations, shooting assignments both on location and in the studio, and in-class critique while challenging students to execute demanding professional-scale assignments including fashion, beauty, still life, portraiture, editorial, complex composites, and more. See more classes here. Imaging: In this photography class, students learn to train their eyes to be able to pre-visualize the possibilities latent in an image, to apply principles of color, and understand how the viewer “reads” an image in order to create photographs that will stand the test of time. See more classes here. Ways of Seeing: Students study and analyze the canon of master photographers, not only by analyzing their distinct techniques, aesthetics, and approaches, but also by literally re-creating their images with precise attention to composition, lighting, gesture, format, and palette. Following this photography class, students are able to select the best methods by which to realize their own unique vision. See more classes here. Vision & Style: With a focus on assignments, students engage in long-term documentary, fine art, and personal projects even as they analyze their fellow students’ work. This culminates in a final exhibition of either personal or commercial work, and the production of a fine art book or commercial portfolio. See more classes here. Shooting and Production Lab: Shooting Lab is a unique, hands-on opportunity to develop core professional skills by putting into practice the principles taught in Photo on location shoots with real-time guidance from instructors. Production Lab assists students in the production, editing, organization, and printing of their final exhibition. See more classes here. Applied Photography: Students acquire a comprehensive set of skills needed to run a successful professional photography business that go far beyond just taking good pictures. They execute a series of assignments under conditions matching as closely as possible the challenges they will face on actual jobs. See more classes here. In addition to this core curriculum, students enrolled in longer programs at the Photography School will delve deeper into the subjects covered in the above photography classes, setting them on the path to pursue photography as a career. 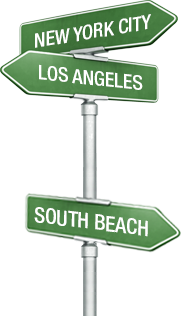 Enroll today in New York City, South Beach, or Los Angeles.